There's something to be said for the view that the Seleucids can be safely ignored by the student of Persian history. They were Macedonians, with no links to Macedonia. They had no interest in the lands they ruled beyond conquest and exploitation. They depended on the loyalty of and goodwill of their subjects and their officials: when they lost this, they lost everything. They failed to preserve Alexander's Asian empire from its centrifugal tendencies, and from new external threats - the Parthians from the east and the Romans from the west. It was impossible to fight on both fronts. But they did - although too late - produce one remarkable leader whose name deserves to be better known: Antiochus III. He was a boy of 18 when he became Great King in 222 BC (the Seleucids had taken this title from the Achaemenids) - even younger than Alexander. He inherited a mess - with rebellions all over his empire. After a shaky start he won back Anatolia, apart from Pergamum and Pontus/Cappadocia. He went on to deal effectively with the Parthians, the breakaway province of Bactria, and even India, restoring all of Alexander's eastern conquests. But he couldn't take Egypt away from the Ptolemies, although he did win Judaea, where he earned praise for sensitive treatment of the Jews. His next ambition was to be the man who restored freedom to Greece. This forced him to take on Rome - and he lost. Defeat by Rome meant he also had to let go what he'd won in Anatolia. He died in 187 BC, knowing that his eastern reconquests, too, were being taken back. The Parthians soon cut communications with the east - allowing Bactria to continue on its own independent path. As the Parthians continued to expand to the west and south, the Seleucids lost Persis and Mesopotamia, and by the 1st century BC were confined to Syria, and eventually just to the area around Antioch. The Romans took even that away from them - and the once vast Seleucid empire ended with a whimper. Among the many cities founded by the Seleucids is one in the far north of Afghanistan, in a good defensive location, where the river Oxus (Amu Darya) joins the Kokcha, on the border with Tajikistan. We don't know what the Greeks called it - it's referred to as Aï Khanum after a nearby Uzbek village. It was probably founded in 300 BC by Seleucus, and had all the trappings of any Greek city thousands of miles to the west: an acropolis, a theatre seating several thousand, a gymnasium, temples dedicated to its founder and to Greek gods, a library with a collection of manuscripts from the "west", coinage showing Greek divinities - Hestia, Cybele, fragments of statues (mostly made of clay as suitable stone was not available locally), sundials, walls, houses for rich and poor - and a palace. No democracy here then! Greek was spoken - and written. All of the numerous inscriptions which have been found are in Greek. Most interesting is a stele (grave-marker) commemorating the founder Kineas, erected by Clearchus, a visitor from Greece c.290 BC - almost certainly the pupil of Aristotle, Clearchus of Soli. On the stele were inscribed the "15 maxims" - attributed to the Seven Sages, also to be found in Delphi. It's a sort of Greek "mission statement", defining the core values of Greekness - the citizens of Aï Khanum were keen to be seen as Greeks. 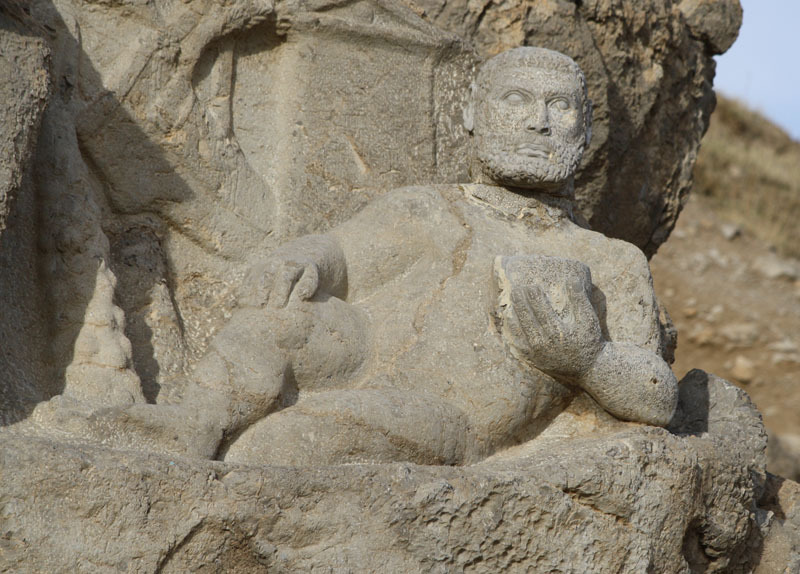 An old man from Ai Khanum; possibly a Greek philosopher? And then, after only 150 years of existence, as a crucial link along the Silk Road connecting China and India with Persia and the Mediterranean, it was largely abandoned; soon to be destroyed by Nomads, probably the Saka from the north-east. They set fire to the palace and robbed the treasury. Locals squatted among the ruins for a few years. There followed a second destruction by the Yuezhi. And from then it remained unknown until French archaeologists uncovered it in the 1960s - in time for a third destruction by the Taliban in 2001. A wonderful small statue of a youth, vandalised in antiquity, was painstakingly restored - only to be smashed again. The site has also been systematically looted by various armies since the Russian invasion of 1979. 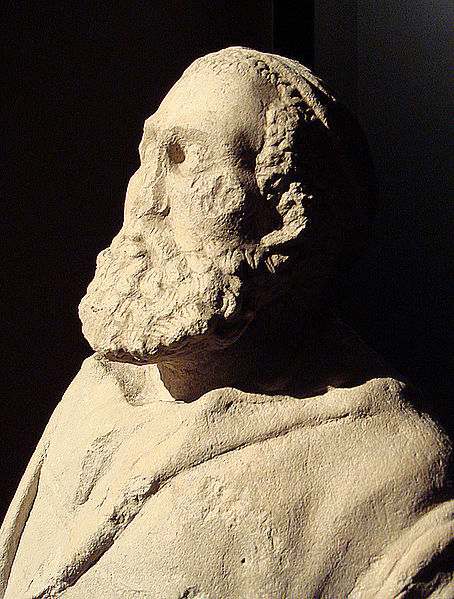 Plutarch wrote that people in the east "are still reading Homer and reciting the tragedies of Euripides and Sophocles"; and perhaps performing them in the theatre. But Greeks were probably only the upper class. Was the vast theatre ever filled? Not everything is Greek: artefacts found there reveal the extent of trade and influence from India and the east. See also Bactria page. 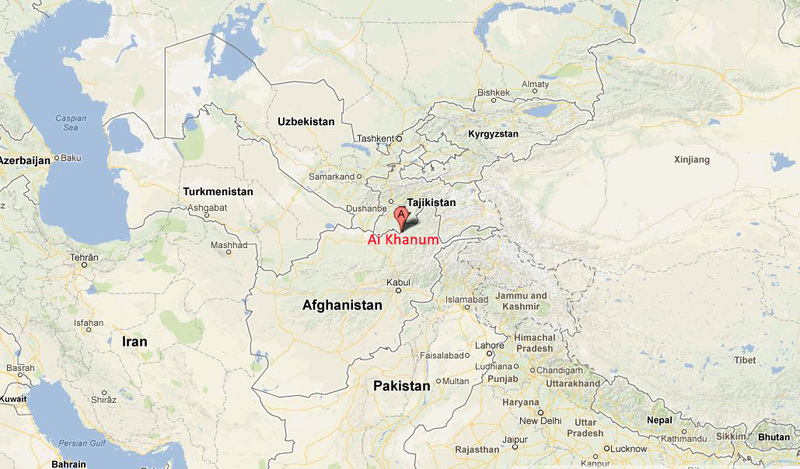 Excellent article on Ai Khanum here. But was all this Greek influence a good thing for the peoples of the former Persian empire? The vast territory was beginning to get connected to the rest of the world - both east and west. Trade flourished, whatever the political and military situation might have been - and Greeks and the Greek language were a driving force in the opening up of Asia to trade. It was the prosperity of the Greco-Bactrian dynasty that encouraged China to develop the Silk Route. The Silk Route enriched the Parthians, in particular, the fortunate middle-men as ideas and goods were exchanged across Eurasia. It was a sweet irony that Roman ladies were able to dress themselves in Chinese silks thanks to the Parthians, deadly enemies of Rome. The achievements of the Seleucids seem slight, but Greek influence encouraged trade which brought prosperity - although it was the Parthians that benefited at first. Modern Antakya in Turkey. Antioch in Syria was founded by Seleucus I, along with Seleuceia on the Tigris. It later became one of the great cities of the eastern Mediterranean, along with Alexandria and Constantinople. As a boy, do what you're told. As a young man, control yourself. In middle age, be fair.